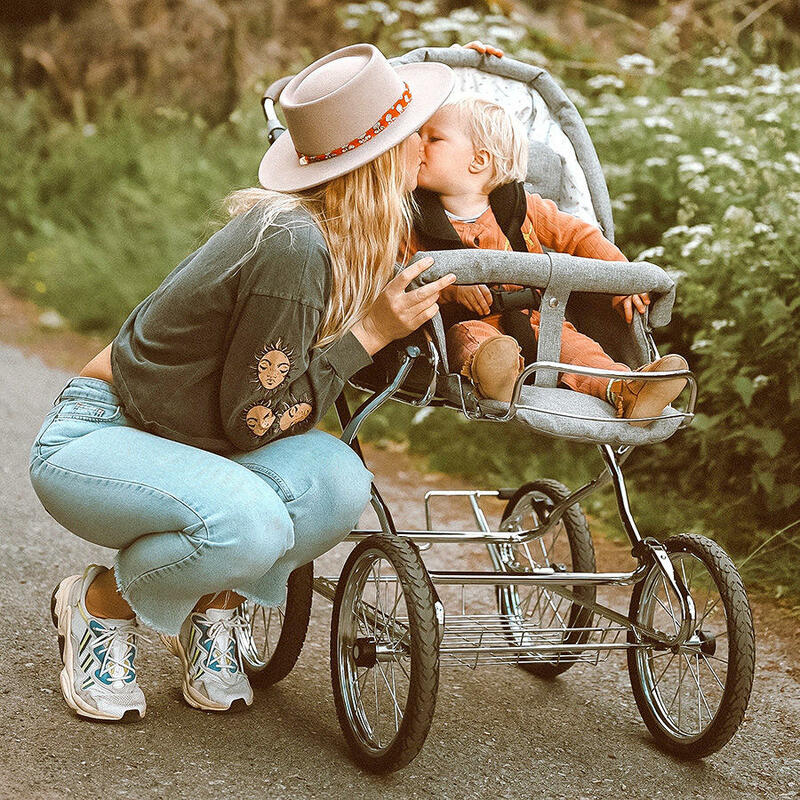 Discover our versatile combination prams of the highest quality and craftsmanship that will be with you and your baby from birth through its days as a toddler in the pushchair. 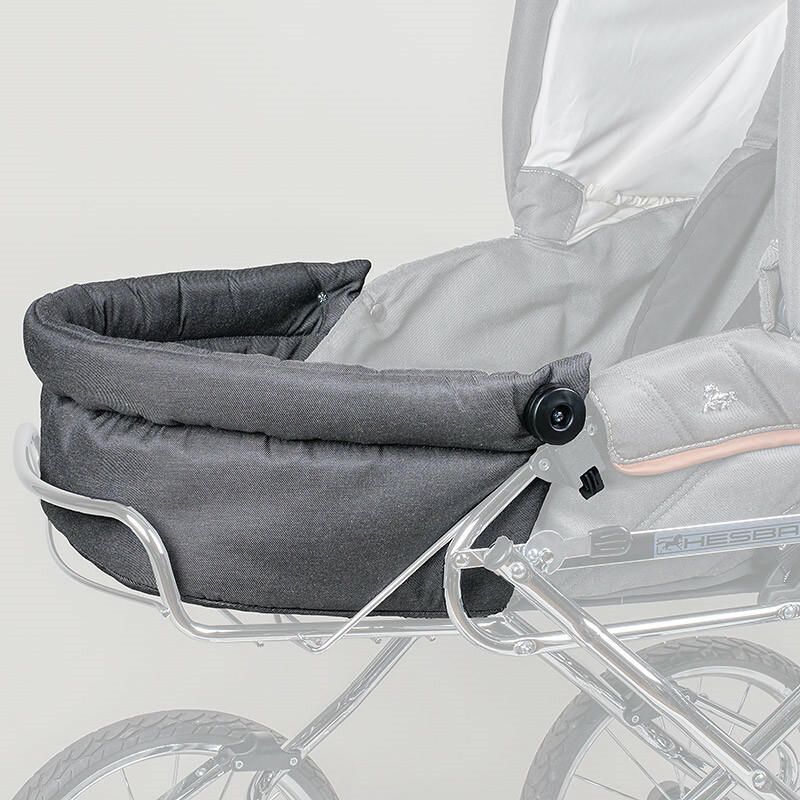 The timeless, classical and very precious design stands out and makes it a very special pram for special people. At the same time, HESBA prams are robust, durable and can be used through every season of the year. That makes them ideal companions in all weather conditions, not just on sunny days. Only a high-quality suspension allows comfortable lying and sitting on bumpy roads. Cobbled roads, paths full of roots – your baby will experience a smooth and undisturbed ride. Your child grows and develops, and our combination prams follow! 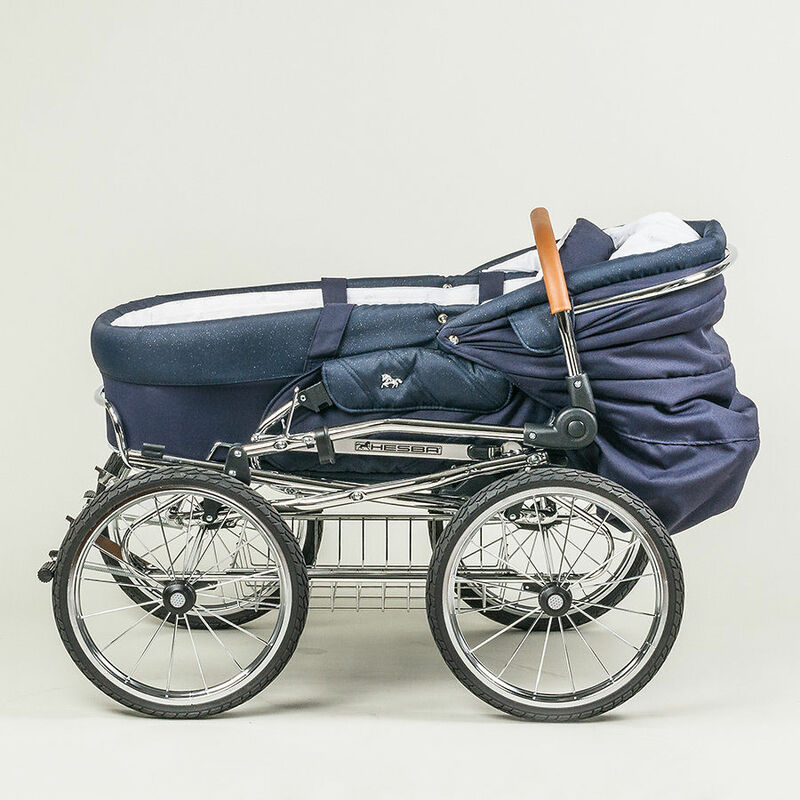 During the first 6 months, your baby lies comfortably in the lie-flat pram, which can also be used as a carrycot. 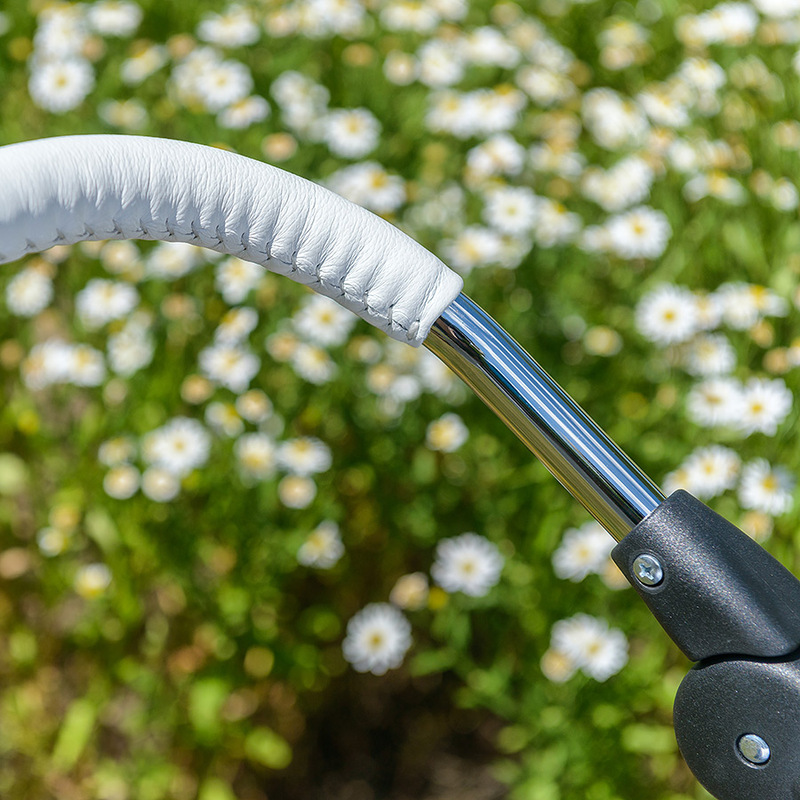 As soon as your baby can sit, it can be put in the pushchair attachment. Create your own pram from numerous colour combinations and give it your own personality and individuality. Pram with removable lightweight carrycot. For a back-friendly development, your child requires a perfect lying area especially during the first months. A horizontal position and plenty of space to stretch are especially important. 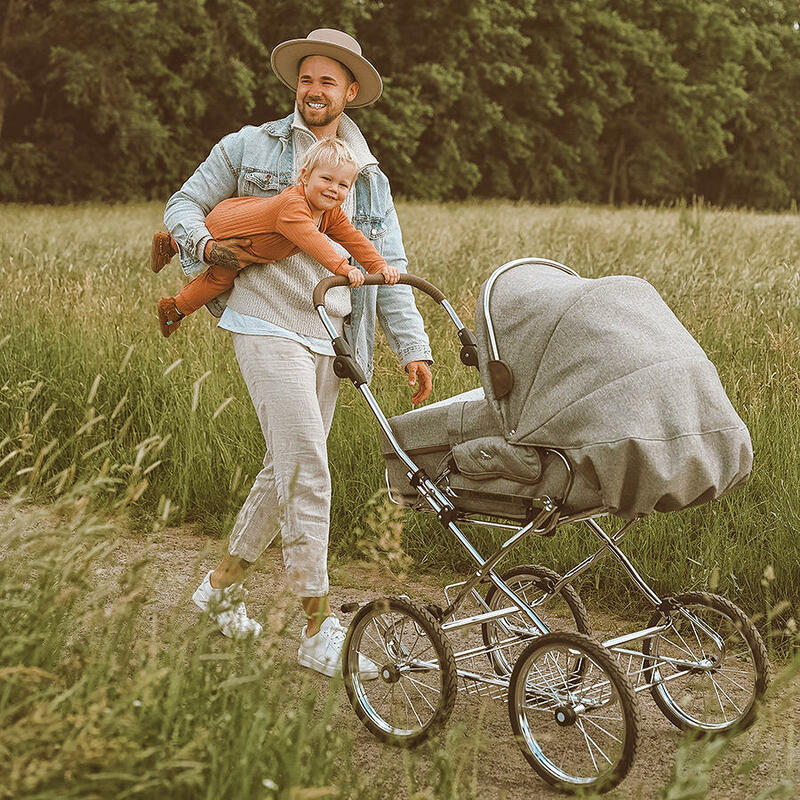 Our specially developed lightweight carrycot is particularly spacious, stable and mobile at the same time and therefore guarantees optimal sleeping comfort. 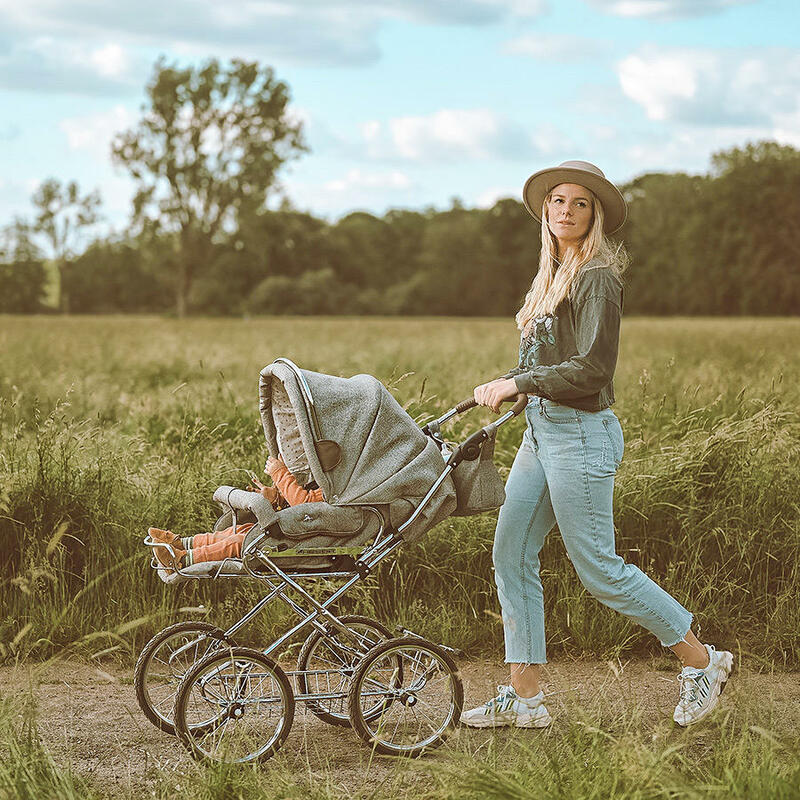 As soon as your baby has fallen asleep in the pram, you can comfortably carry it in the carrycot into the house without having to wake it up. Mattresses are available as accessories and provide perfect lying comfort. As soon as your child can sit independently, the carrycot is often no longer of use. 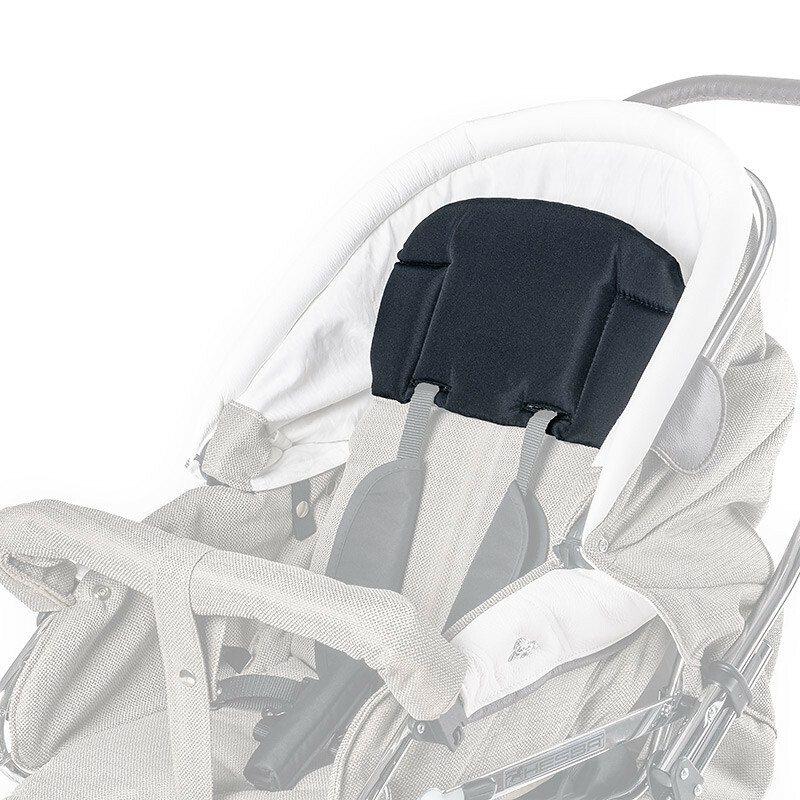 By attaching the safety bracket the pram attachment can be modified into a pushchair without problems. The backrest can be adjusted in five different positions and allows sitting, lying or lying in a higher position. 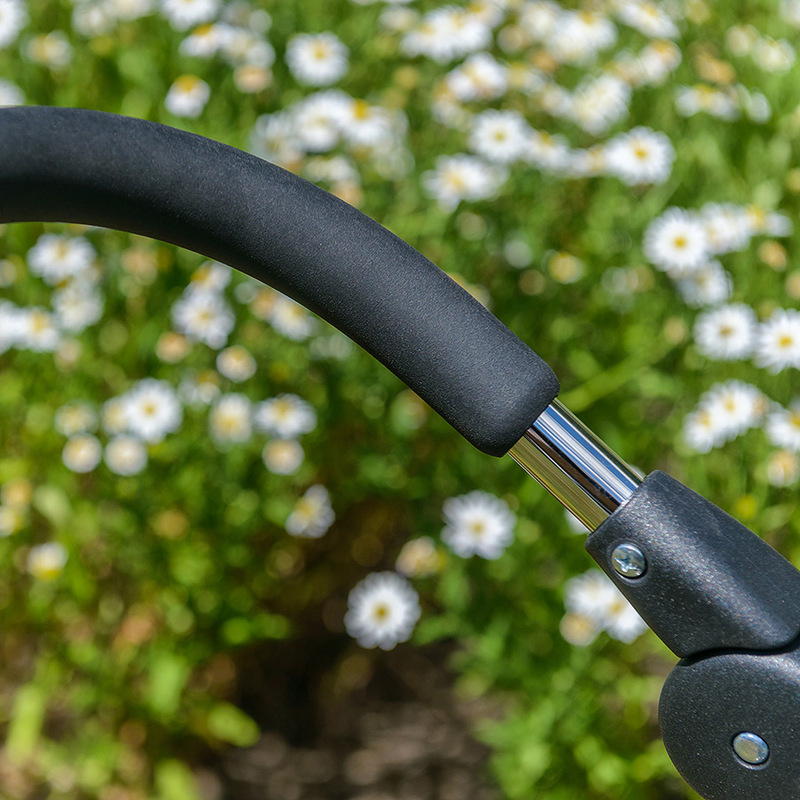 The pushchair attachment can be positioned flexibly either facing forwards or backwards. The footrest can be adjusted in three positions. The canopy can be removed. 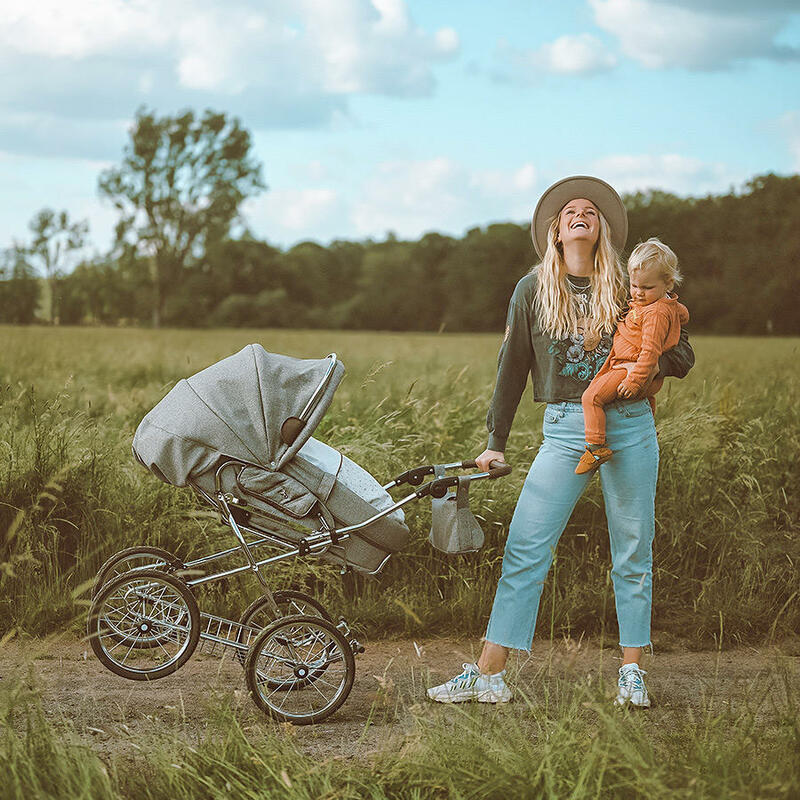 Once it has outgrown the carrycot, your child can enjoy the enlarged interior achieved by extending the pushchair attachment with an extension part available as accessory. For more information you can check the accessories page. 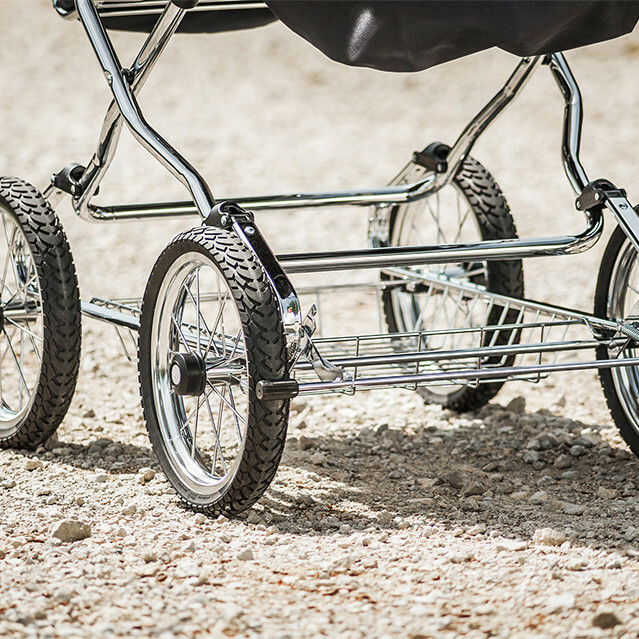 Thanks to the soft-joint suspension, the pram navigates uneven surfaces, country paths and cobbled roads easily. 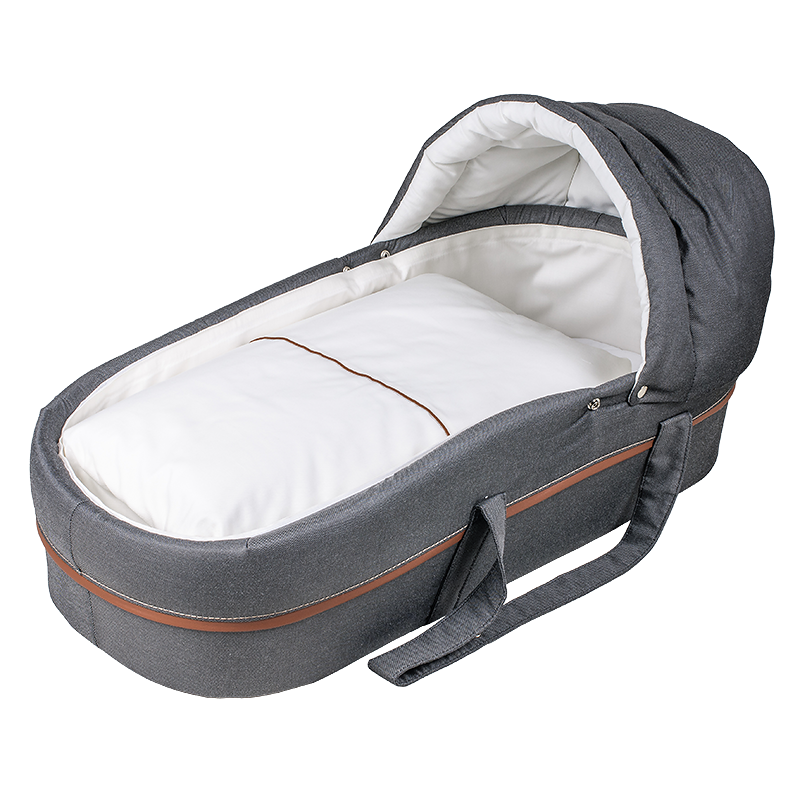 The smooth rocking allows the babies to sleep peacefully and undisturbed. This suspension-feature supports a back-friendly development of your child. 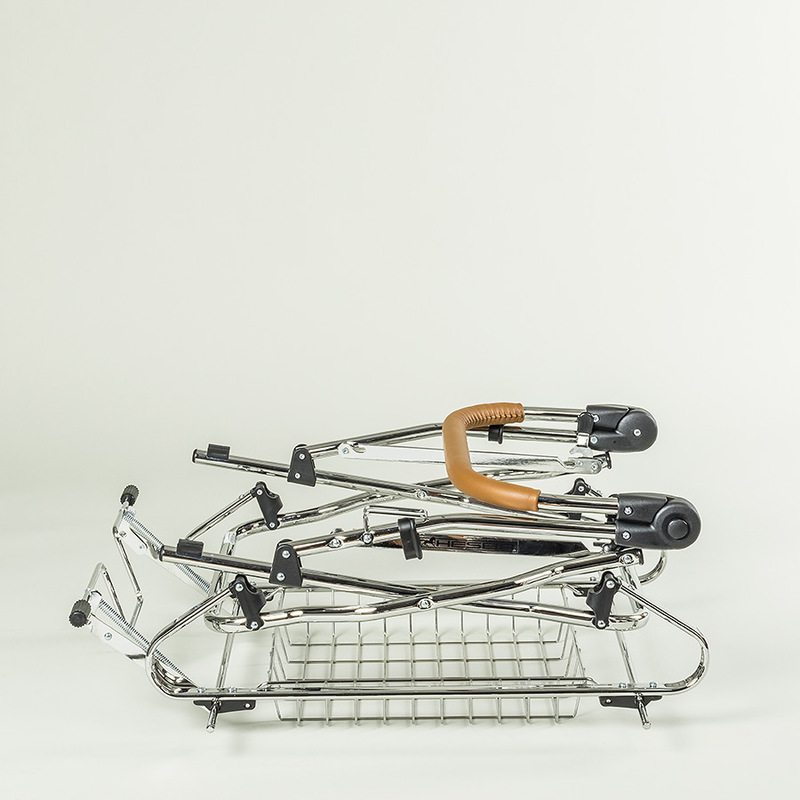 The chrome-plated steel tube chassis is robust and extremely durable. 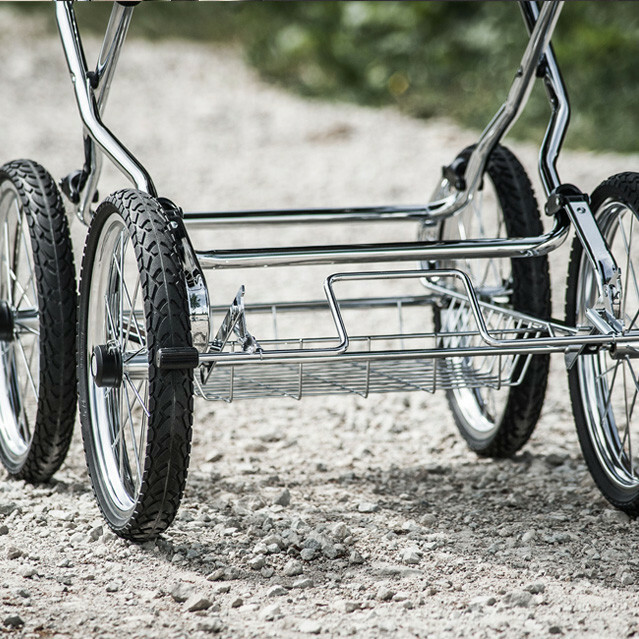 The basket at the bottom of the chassis can be loaded with a max. weight of 5 kg and helps when transporting small shopping. The chassis is collapsible to be stowed away e.g. in the car trunk. Please note, Chrome has to be maintained regularly. 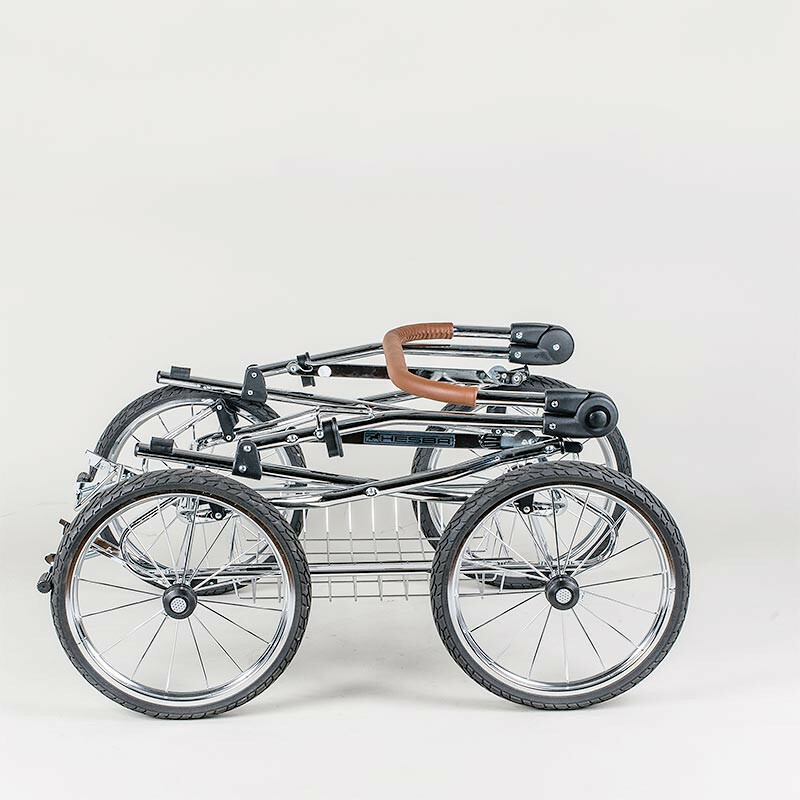 Depending on the wheel size, the chassis is delivered with U-brakes (rim Ø: 30 cm) or standard brakes (rim Ø: 25 cm). Both types of brakes can be easily operated with one foot. 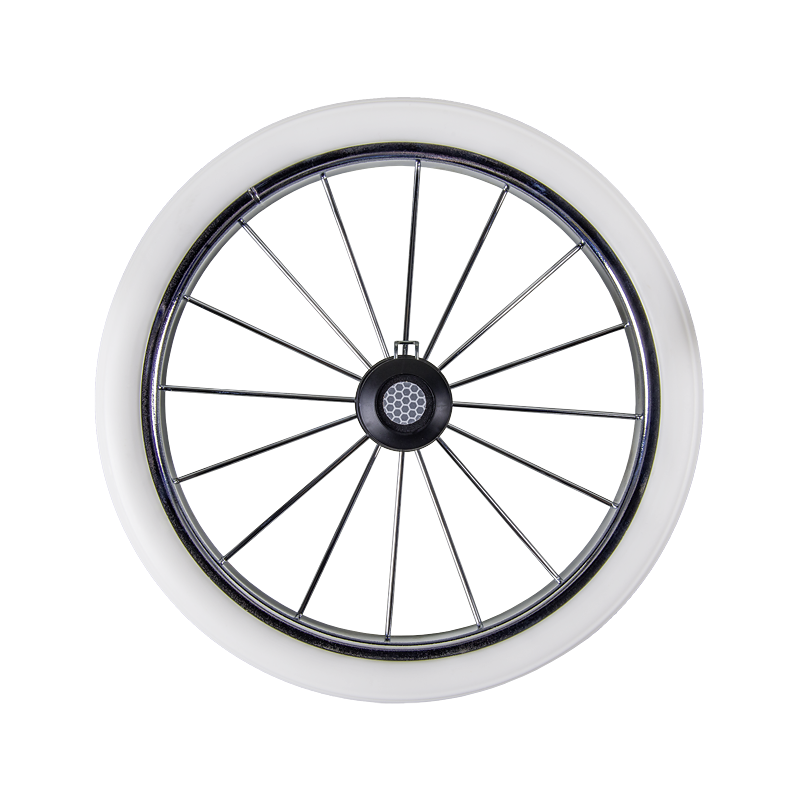 The height of the standard push handle with contaminant-free „solight ecco ®“ covering can be adjusted and it can be folded down. It is also available with real hand-sewn leather. 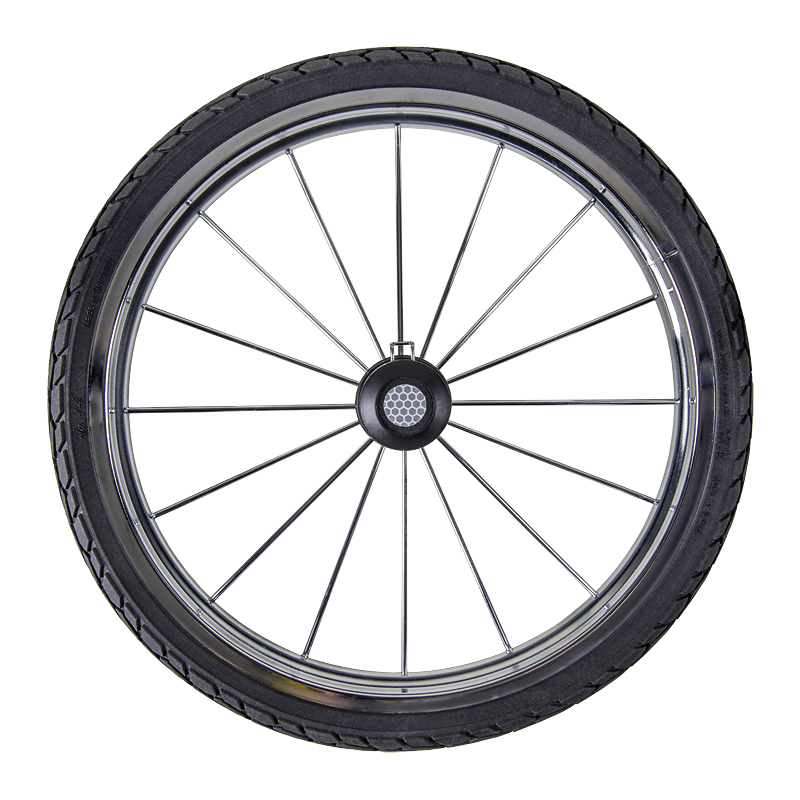 • Sporty pneumatic tyres in rim size 25 cm, Colour: black. 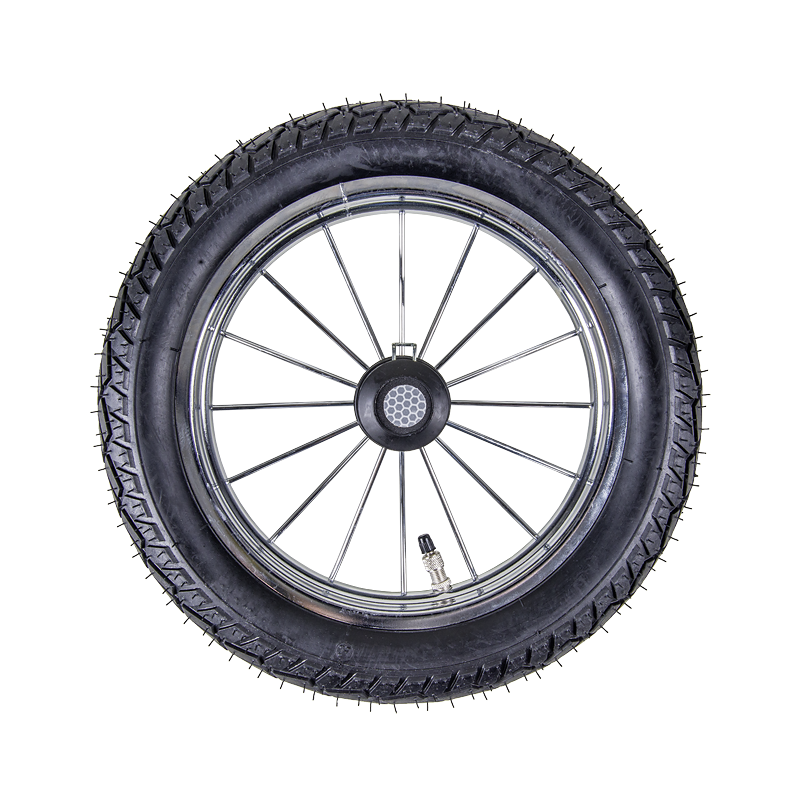 • The elegant hard rubber tyres are less durable but they are a nice alternative as elegant second wheel set for the Sunday outing in the city. Colour: white. 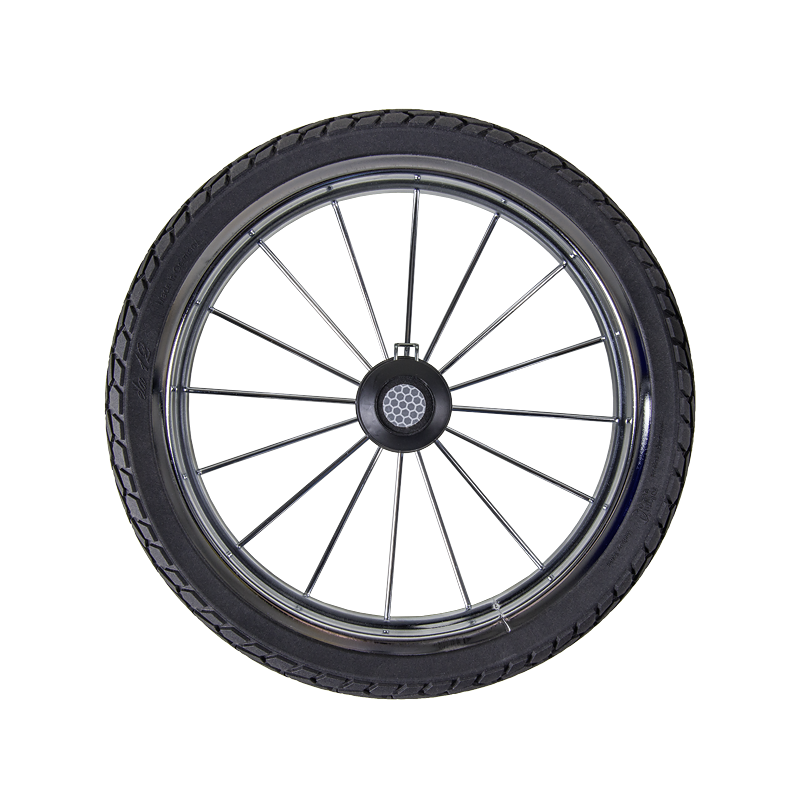 Available in both rim sizes (25 and 30 cm) which can be combined. 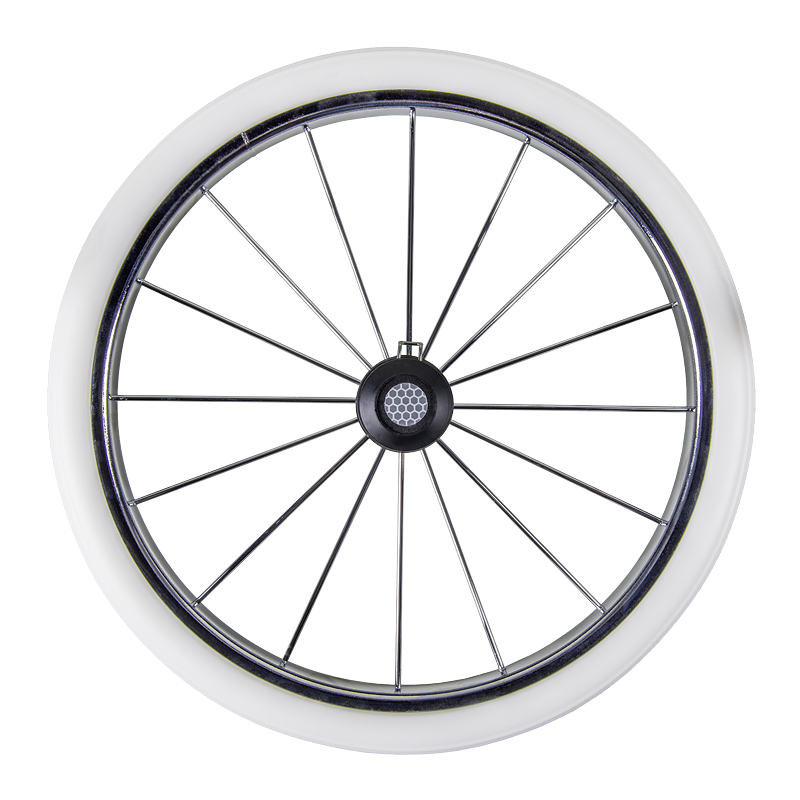 All wheels have chrome-plated spokes.